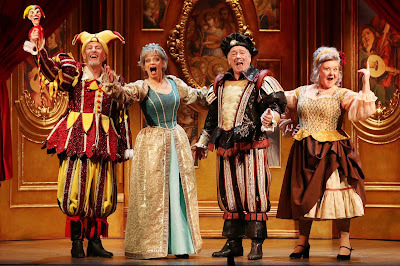 9th April 2018: It’s good to see Quartet touring regionally after the success of the film in 2012, produced by Cheltenham Everyman and starring Paul Nicholas, Wendi Peters, Jeff Rawle and Sue Holderness. It’s a shame that for a production about opera singers that the PR/graphics department couldn’t actually get the musical notation correct on the publicity material. 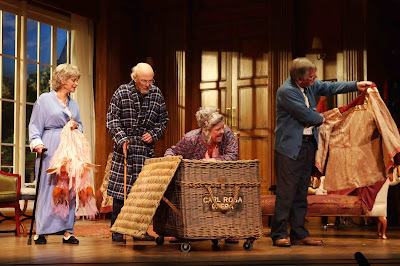 It’s perfect fare for Richmond Theatre’s target audience it would seem and there was much knowing laughter as it rhapsodises on the themes of old age and the passing of time, with all its pitfalls, as they rail against the ‘dying of the light’ with the mantra NSP (No Self Pity). It is generally very well observed and touching on the themes of deterioration, dementia, impotency, regret and even sexual harassment in a nod to the #MeToo movement. It is a gentle, bittersweet but largely unchallenging comedy with a very slight plot concerning the annual Verdi birthday concert in which they have been asked to sing the Quartet from Verdi’s Rigoletto, which has langurs, especially in act 2, that aren’t helped by some long-winded scene changes. The two chairs in the final act seemed incongruous compared to the rest of the country house furniture. It starts very promisingly with a great opening line-which I won’t spoil here-and has some good one-liners throughout delivered by a generally accomplished cast and a lovely definition of art. “Art is meaningless if it does not make you feel”. However the style of acting seems slightly at odds with each other. Wendi Peters channels a senile Hyacinth Bouquet for the majority of the time but feels too much of a caricature particularly compared with the men. Paul Nicholas strikes just the right note as the irrepressible Wilfred. Sue Holderness is not entirely convincing as the diva Jean, particularly when revealing the reason for her early retirement but Jeff Rawle as her ex husband enjoys his momentary outbursts, all seething resentment and unrequited love. It’s good Sunday afternoon-type entertainment after a satisfying lunch. If you liked the film or the likes of The Second Best Marigold Hotel and its ilk you will probably enjoy this.